SCAD was first reported in 1931.2 Since then, there have been <1300 reported SCAD cases; most were published in the past 5 years. The Canadian SCAD Study (CanSCAD) was conducted to improve our understanding of the natural history of this relatively infrequent condition.3 This is a multicenter, prospective, observational study that enrolled 750 SCAD patients from 22 North American centers from 2014 to 2018. All coronary angiograms were adjudicated in a core laboratory. We aimed to incorporate insights learned from this study for this review. Conditions that increase intracoronary shear stress, such as increase in thoracoabdominal pressure or catecholamines, may precipitate SCAD. The most common precipitating factor in the CanSCAD cohort was emotional stress, reported in 50.3% of patients (rated as high to severe stress). Another important stressor is intense physical stress, reported in 29%, with isometric activities lifting >50 lb in 10%.3 These have management implications because changes in lifestyle or psychological well-being may impact SCAD recurrence. Given that lifestyle and psychological stressors could affect SCAD recurrence, cardiac rehabilitation including exercise program, psychosocial counselling, and peer support can be beneficial.17 Patients are advised to avoid heavy weightlifting (threshold for women is 30 lbs and men is 50 lbs) and to have lower target heart rate (50-70% heart rate reserve) and systolic blood pressure of <130 mmHg with exercise during rehabilitation after SCAD event. SCAD is increasingly recognized as an important cause of MI that predominantly affects young to middle-aged women. Much knowledge was gained from the CanSCAD study, which is currently the largest, prospective, observational SCAD study. SCAD is often associated with FMD, psychological stressors, and isometric exertion. 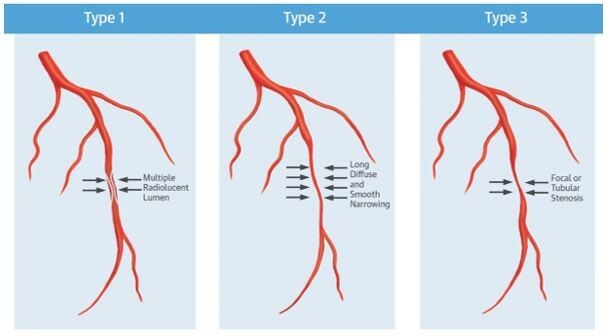 Coronary angiogram remains the gold-standard for SCAD diagnosis, with Type 2 SCAD being the predominant angiographic appearance. Conservative therapy appeared to be safe and is the preferred treatment strategy unless patients have high-risk features. Overall survival is excellent after a SCAD event. However, cardiovascular morbidity including recurrent MI, unplanned revascularization, and stroke/transient ischemic attack may occur within 30 days of SCAD diagnosis. Peripartum SCAD and concomitant connective tissue disorder appear to be independent predictors of 30-day MACE. Further studies are required to better understand this condition, including evaluating the long-term event rates with SCAD and risk stratification and best strategy for management. Saw J, Mancini GB, Humphries KH. 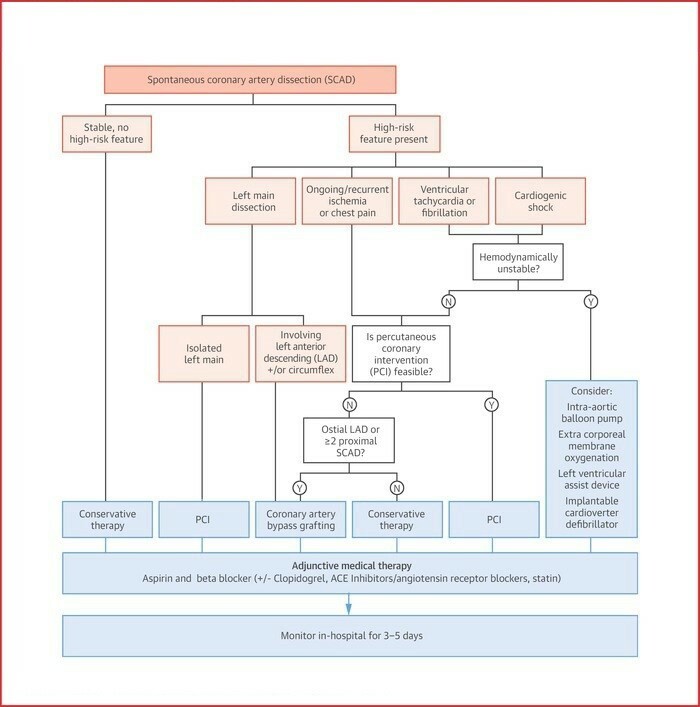 Contemporary Review on Spontaneous Coronary Artery Dissection. J Am Coll Cardiol 2016;68:297-312. Pretty HC. Dissecting aneurysm of coronary artery in a woman aged 42: Rupture. Br Med J 1931;1:667. Saw J, Starovoytov A, Humphries K, et al. Canadian Spontaneous Coronary Artery Dissection Cohort Study. ESC Congress 2018; Munich, Germany. August 30, 2018. Saw J, Ricci D, Starovoytov A, Fox R, Buller CE. Spontaneous coronary artery dissection: prevalence of predisposing conditions including fibromuscular dysplasia in a tertiary center cohort. JACC Cardiovasc Interv 2013;6:44-52. Saw J, Aymong E, Sedlak T, et al. Spontaneous coronary artery dissection: association with predisposing arteriopathies and precipitating stressors and cardiovascular outcomes. Circ Cardiovasc Interv 2014;7:645-55. Tweet MS, Eleid MF, Best PJ, et al. Spontaneous coronary artery dissection: revascularization versus conservative therapy. Circ Cardiovasc Interv 2014;7:777-86. Rogowski S, Maeder MT, Weilenmann D, et al. Spontaneous Coronary Artery Dissection: Angiographic Follow-Up and Long-Term Clinical Outcome in a Predominantly Medically Treated Population. Catheter Cardiovasc Interv 2017;89:59-68. Roura G, Ariza-Solé A, Rodriguez-Caballero IF, et al. Noninvasive Follow-Up of Patients With Spontaneous Coronary Artery Dissection With CT Angiography. JACC Cardiovasc Imaging 2016;9:896-7. Saw J, Aymong E, Mancini GB, Sedlak T, Starovoytov A, Ricci D. Nonatherosclerotic coronary artery disease in young women. Can J Cardiol 2014;30:814-9. Nakashima T, Noguchi T, Haruta S, et al. Prognostic impact of spontaneous coronary artery dissection in young female patients with acute myocardial infarction: A report from the Angina Pectoris-Myocardial Infarction Multicenter Investigators in Japan. Int J Cardiol 2016;207:341-8. Lettieri C, Zavalloni D, Rossini R, et al. Management and Long-Term Prognosis of Spontaneous Coronary Artery Dissection. Am J Cardiol 2015;116:66-73. Hill SF, Sheppard MN. Non-atherosclerotic coronary artery disease associated with sudden cardiac death. Heart 2010;96:1119-25. Tweet MS, Hayes SN, Pitta SR, et al. Clinical features, management, and prognosis of spontaneous coronary artery dissection. Circulation 2012;126:579-88. Liang JJ, Prasad M, Tweet MS, et al. A novel application of CT angiography to detect extracoronary vascular abnormalities in patients with spontaneous coronary artery dissection. J Cardiovasc Comput Tomogr 2014;8:189-97. Saw J. Coronary angiogram classification of spontaneous coronary artery dissection. Catheter Cardiovasc Interv 2014;84:1115-22. Hayes SN, Kim ESH, Saw J, et al. Spontaneous Coronary Artery Dissection: Current State of the Science: A Scientific Statement From the American Heart Association. Circulation 2018;137:e523-e557. Chou AY, Prakash R, Rajala J, et al. The First Dedicated Cardiac Rehabilitation Program for Patients With Spontaneous Coronary Artery Dissection: Description and Initial Results. Can J Cardiol 2016;32:554-60.